Effective treatment methods for anxiety disorders were just starting to enter the mainstream when David Carbonell, Ph.D. began his career as a psychologist over 25 years ago. He’s been helping people overcome fears and phobias, and developing new treatment strategies, ever since. Using humor, compassion, and acceptance with cognitive behavioral methods, Dr. Carbonell has taught his unique blend of CBT, ACT, Metacognitive Therapy and Paradoxical Therapy to thousands of mental health professionals across the country. It’s his goal for you to leave armed with an approach, and numerous specific tools, that you can use the next day. Dr. Carbonell is the “Coach” at the popular self-help site www.anxietycoach.com. He is also the author of The Worry Trick (New Harbinger Publications, 2016) and Panic Attacks Workbook (Ulysses Press, 2004). He’s the founding member of The Therapy Players, an improvisational comedy troupe of psychotherapists, and a frequent speaker at annual conferences of the Anxiety and Depression Association of America. Clinicians rave about David’s guiding formulation of the Anxiety Trick, the simple, humorous language with which he describes it, and the way he helps you translate it into practical, powerful interventions. 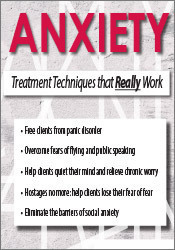 Join him for a day and go home ready to use innovative new strategies for helping your anxious clients! Non-financial: David Carbonell has no relevant non-financial relationship to disclose.